Occurrence: In Louisiana, the Cercospora Leaf Spot is a disease is observed between the late spring and summer seasons, especially during periods of frequent rainfall. 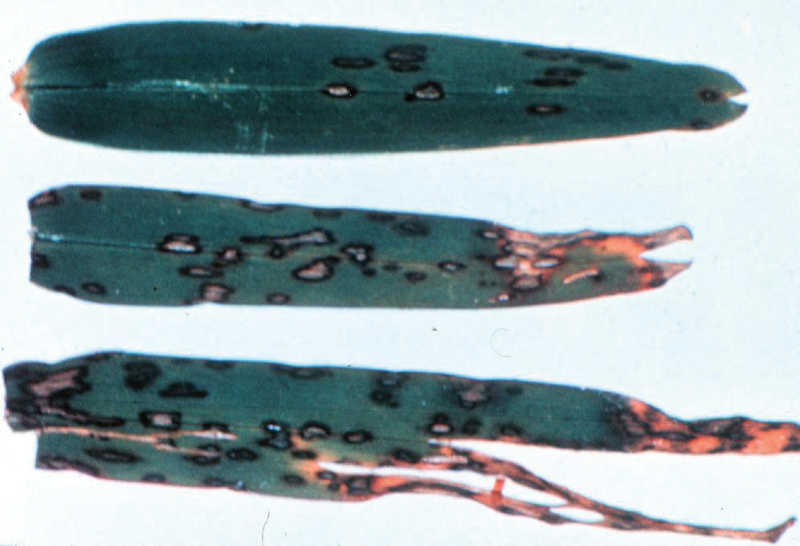 St. Augustinegrass is more susceptible to this disease development when under cultural or environmental stresses. An example of an ideal environment to promote the disease is when the soil is low in fertility or suboptimal light, moisture and wind conditions are conducive to the development of this disease. Symptoms/Signs: Initial symptoms on leaves are noticeable by narrow, dark brown leaf spots. Over time, these spots enlarge into oblong to irregularly shaped lesions with dark tan centers and dark brown to purple margins. When humid conditions are high, the lesion centers of the leaf blade may exhibit a whitish sheen to the spot. This is due to the abundance of sporulation of the pathogen. If there are numerous spots on multiple leaves, this can cause extensive yellowing and withering. This disease is very similar in pattern and symptoms to gray leaf spot and miss-diagnosed frequently in lawns, but management is very different. Cercospora leaf spot symptoms on St. Augustinegrass. Cultural Controls: The risk of Cercospora leaf spot disease can be reduced is proper cultural practices are practiced. Prevention starts by fertilizing adequately. Use a slow-release nitrogen sources balanced with potassium (preferably, a slow-release potassium form). Another important topic is irrigation. Three factors to consider with irrigation are correct timing, frequency, and amount. Monitoring should be an on-going event where daily or frequent irrigation cycles can promote foliar disease can escalate. So, timing of irrigation is also important in terms of time of day and duration. The proper Irrigation time of day should only occur in the early morning hours (between 3:00 and 8:00 a.m. +/-) when dew is already present, so as not to extend the dew period. As a general rule, the turf should only be irrigated when it exhibits moisture stress. The need for irrigation will differ according to several things. Soil type (i.e. Sandy vs clay) is a factor commonly overlooked when setting irrigation needs. Sandy soils will tend to dry out faster than clay and more water may be needed more frequently than clay type, so the frequency should make reference to this. Sun (Full sun vs Shade) exposure is another factor. Sunlight is another factor. Lawns in shade will tend to not dry out as fast as the lawns in full sun. Areas in full sun may need more moisture compared to shady areas. Wind (Windy vs calm) is something you cannot control but it will have an influence as well, for a lack of wind will not dry a lawn as fast as on a windy day. If Cercospora leaf spot is already present, the disease can be managed with the application of quick-release nitrogen in a fertilizer blend balanced with potassium (N:K ratio of 1:1). The fertilizer can be applied at 1/2 lb N per 1000 sq ft and should be ammonium nitrate, ammonium sulfate, or quick-release urea formulation. Consult with your ExtensionCounty Agent prior to the application. A prevention measure is to use a more resistant varietiy such as the St. Augustinegrass cultivar 'Bitterblue'.